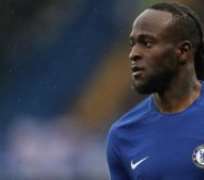 'Victor Moses needs to improve' as a winger, according to Chelsea coach Maurizio Sarri. The Nigeria international has been limited to a squad player after enjoying two seasons as an integral part of the Blues' set-up. The former West Ham wideman rejuvenated his injury-ravaged career under former Chelsea boss Antonio Conte, with the former Juventus gaffer deploying the player as a right wing-back in his preferred 3-5-2 formation. However, with new coach Sarri preferring a 4-3-3 set-up, the ex-Nigeria international has to feature as an out-and-out winger – and he’s fallen down the pecking order at the Stamford Bridge outfit, with the likes of Eden Hazard, Willian and Pedro ahead of him. Since the start of the campaign, Moses has played only nine minutes and the Italian has put it down to his switching process which needs some time. “Because he changed the position on the pitch last season he played [at right wing-back], and now we want him to play like a winger,” Sarri said in a pre-match conference. Chelsea play Bournemouth in their next league outing, and Moses will hope to see some game action.